Lenovo Mirage VR180 actual sample user videos! 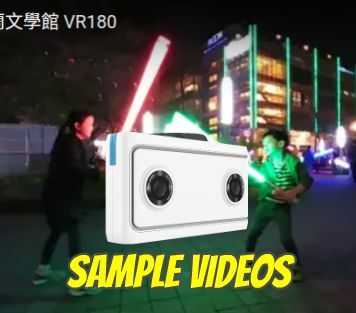 Here is a playlist of some user videos that appear to be from the Lenovo Mirage, the first Google VR180 camera on the market, due for release on May 6. The videos were taken by Jeremy Chen. The sample videos include outdoor, indoor, and low light videos. Because the videos are in Google VR180 format, they appear as flat, non-360 4K videos. But if you view them on a phone in the YouTube app and tap on the Google Cardboard icon, you’ll see them as 3D 180 videos. Meanwhile, I’ve also gotten the Mirage. Check out my review. I will also definitely get the Yi Horizon when it becomes available later this year. If you’re interested in Google VR180, check out the VR180 group on Facebook. I downloaded (as SBS 3D) and took a look at one of the clips (the one with the buses) and IQ looks pretty good when viewed on a monitor. Headset viewing should be OK. But I think the big problem is most people won’t care to spend another four hundred bucks to view their content. I think that most will prefer to get a low-cost folding viewer for their phone and that will suffice. Hi Francois. Yes i think the iq looks decent on a monitor. yes, i think it’s up to us 3D and 360 veterans to lead by example, and create good content, show people how to compose for this exciting new medium! I’ve seen a few videos. But has anyone seen any VR180 photos? Are any of the 360 sites such as Kuula hosting or will host them? Hi Bill. I’ve already talked to Kuula a few times about 3D and they don’t seem to believe in it. However, Veer has flexible viewing options, so i think they may be able to support it. Orbix360 also supports 3D 180 photos, so they might support it as well. From your list. In the one from inside while driving a car. Did you notice that when the car turned that the camera view maintained the original direction? Is there some type of stabilization in the Mirage? Hi Bill yes i noticed that too. it’s also in the sample of the first video, with the room. So yes it appears there is some type of gyro stabilization. That’s the good news! On the other hand, google needs to change the flat view so that it maintains the front heading rather than a fixed compass heading. good question! I don’t know…! Mark Qvist answered a similar query in the Insta360Pro feedback group on Facebook. I hope it’s OK to quote him below, Mic? Hopefully someone figures out how to stabilize these videos for viewing in non YouTube/Non Daydream headsets such as the Oculus Go. Insta360 Studio now supports FlowState for Insta360 ONE!